To continually find fresh material that will be exciting for the younger members of the congregation yet remain meaningful for older members can be a daunting task. DIY Guide to All-age Worship for Years B and C are aimed at encouraging and further equipping those already act­ively involved whilst enabling those who aren't to explore the oppor­­tunities available. These books for Years B and C offer simple yet practical advice as to how to improve what is there... or even start afresh with new services. and there are photocopiable acetate masters illustrating the points made in each service. DIY Guide to All-age Worship: Year C by Tim Storey is published by Kevin Mayhew and is our 453rd best seller. The ISBN for DIY Guide to All-age Worship: Year C is 9781844171538. 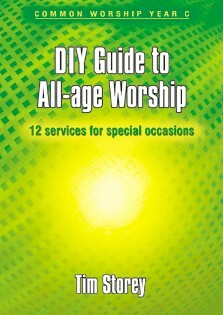 Be the first to review DIY Guide to All-age Worship: Year C! Got a question? No problem! Just click here to ask us about DIY Guide to All-age Worship: Year C.
A:This year is year B, and so the above item is perfect for 2019. Thank you for using the Q&A Forum.